Sun., Sept. 17, 2017, 3:21 p.m. 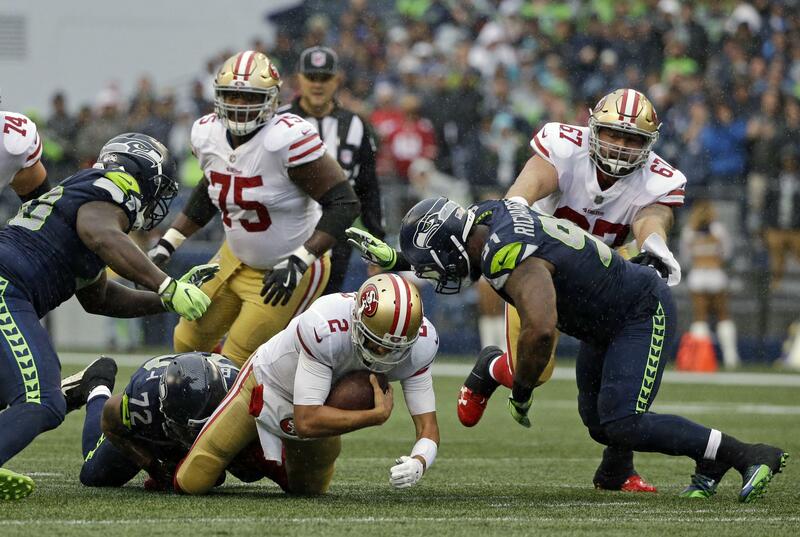 Through the first six quarters of their respective campaigns, the Seahawks and 49ers have yet to reach the end zone. Not that the two NFC West rivals haven’t had their chances today at CenturyLink Field. Seattle’s offense looked efficient on its opening drive as it dinked and dunked its way to San Francisco’s 7-yard line. Seattle’s third-down woes continued, however, as the 68-yard, 16- play drive ultimately stalled and settled for a Blair Walsh field goal. And when Bobby Wagner’s interception of Bryan Hoyer gave Seattle its next scoring opportunity, Seattle reached the red zone again, only to tack another Walsh field goal after Tanner McEvoy dropped a Russell Wilson pass between a pair of defenders in the end zone on third down. The 49ers’ offense was inept (146 yards) save for pair of long Carlos Hyde runs in the second half, both runs setting up field goals. Hyde accounted for 102 yards on seven carries. For the second straight week Seattle’s run game was ineffective. Even with the return of starter Thomas Rawls (6 carries, 3 yards). Totaling all of 39 yards on 17 carries. Rookie running back Chris Carson, a seventh-round draft pick out of Oklahoma State, leads the way with the 23 yards on eight carries. Russell Wilson completed 16 of his 25 passes for 128 yards had better protection than he did a week ago, although was he was sacked twice. Published: Sept. 17, 2017, 3:21 p.m.